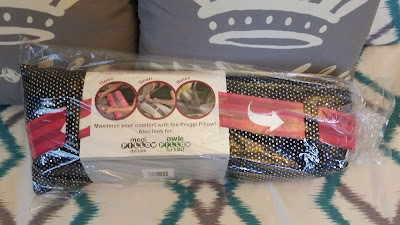 Thank you to Owie Pillow for providing me with product, free of charge, in exchange for my honest review. All thoughts and opinions expressed are my own. Every expectant mother knows that traveling can become uncomfortable during the second and third trimesters of pregnancy. As baby grows, so does the tummy, and wearing a seatbelt can be bothersome. Of course, seatbelts are necessary to keep us safe as we travel. I had grown used to just dealing with the discomfort of seatbelt use during pregnancy, but what I couldn't get over was the pain and irritation I experienced wearing my seatbelt after my C-section. I have a planned C-section this time around, and though I'm not necessarily looking forward to it, I know what to expect, and know that I need a little extra protection around the abdomen for a few weeks after surgery. 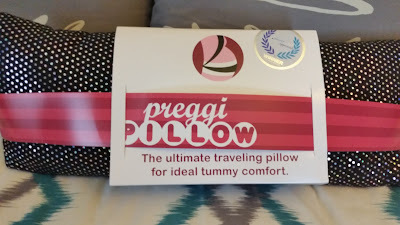 The ultimate travel pillow for tummy comfort during and after pregnancy, or after surgery comes from Owie Pillow, also known as Preggi Pillow. The Owie Pillow is for anyone who is seeking a more comfortable ride while wearing their seatbelt. The Owie Pillow is an award-winning product, having received a coveted award from PTPA (Parent Tested, Parent Approved), and is based in sunny California. Designer and Owner Kristine Currier was excited to share Owie Pillow with me, and couldn't wait to try it out. The Owie Pillow was nicely packaged, and ready for me to use. The Owie Pillow was originally called Preggi Pillow, but Kristine told me that quite a few men had also been ordering the pillow to use for recovery time after hernia surgeries, so she thought a dual name would be better suited for the versatile pillow. The Owie/Preggi Pillow came with a directional packaging, which showed how easy it is to use it with the seatbelt. Also on the packaging, the PTPA Award Seal! This is definitely something I look for when purchasing products for myself or my family. 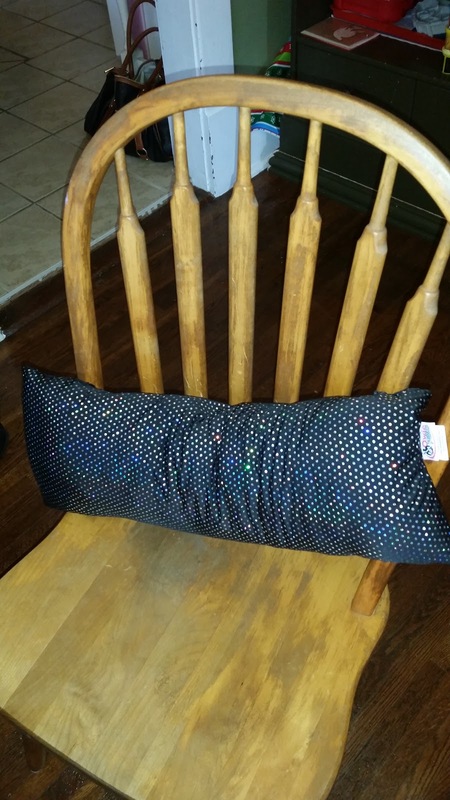 I received the black sequin pillow, and I love it- it's so sassy and fun! The pillow is long and well cushioned. I love the sparkling sequins. 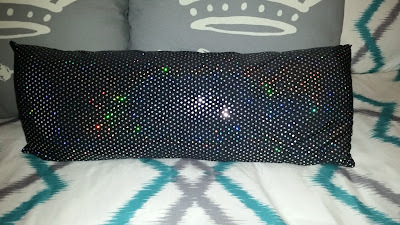 When I use this pillow in the car and the sun hits it, it really dazzles! My first experience with the pillow was back in October, when we went on a trip from NC to LA. It was a 14 hour drive, and we drove straight through. I wasn't super pregnant at that point, but I was 2 1/2 months along, so I was in that still not feeling too well stage of the pregnancy. I knew I needed to rest and nap in the car, so I brought the Owie Pillow along. It was the perfect travel companion. I was able to comfortably use it and nap, as I needed to. 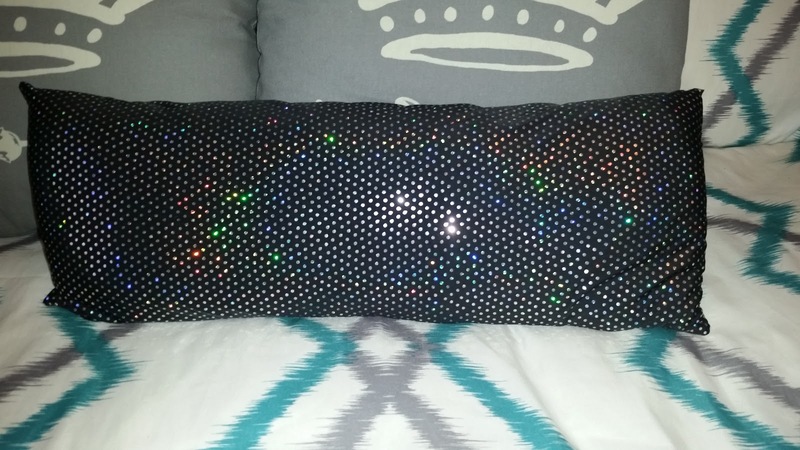 The only thing that my five-year-old son noticed when he went to snuggle with the pillow in the car one day, was that the sequins were a little scratchy against the skin, and I would agree. Thankfully, the pillow insert comes out, and you can use it without the cover, if you want to. I haven't really needed to use the pillow too much for tummy comfort in the car, yet. I have mostly been using the pillow at home, and over the next few weeks (9 weeks to go until baby arrives! ), I know I will be using it even more, as my back has been killing me. I love this pillow as a back support pillow. It gives just the right amount of support, and I can place it where I need to. I use the Owie Pillow daily when I sit at the dining table. Our dining chairs are sturdy, but they have become uncomfortable for me to sit in for an extended period of time. 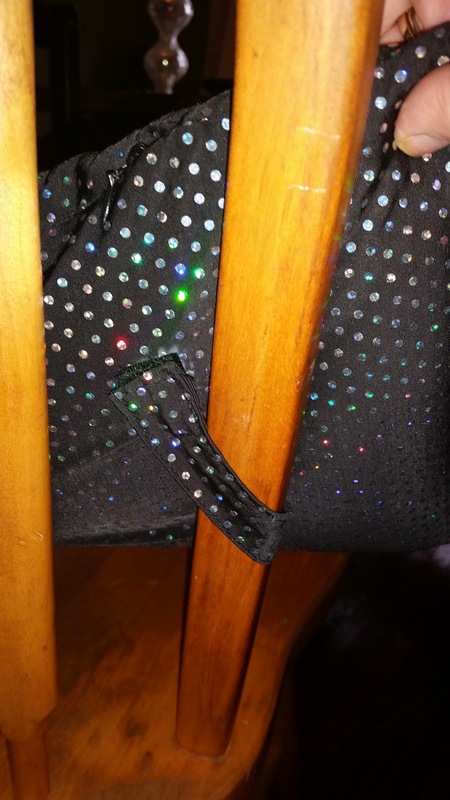 I can quickly and easily move the Owie Pillow from place to place, and since it has thin straps on it, I can attach it not only to the seatbelt in the car, but to the chair in the dining room. Just loop the strap around the chair, and Velcro closed! I use the pillow when sitting on the couch, playing on the floor with my son, in the car, and I even take it with me when we go to family or friend's houses. It's so lightweight and squishable, I can take it pretty much anywhere! 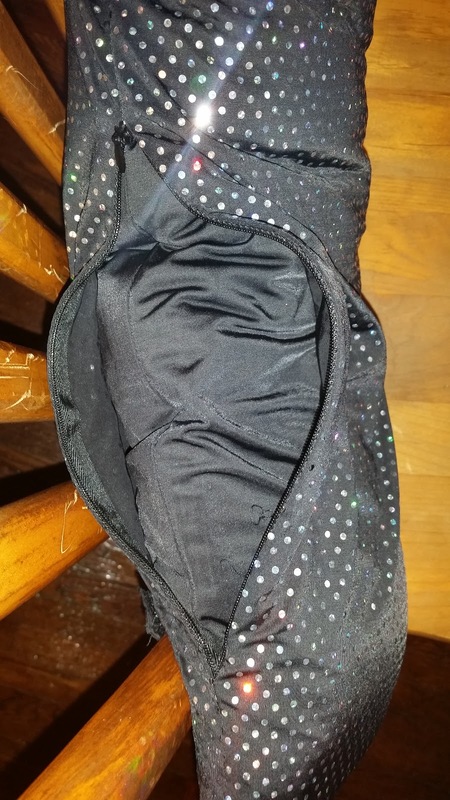 The sequined cover comes unzipped, and is washable. I have even been keeping this pillow by my bedside, and using it in the middle of the night for a little extra support. I sometimes wedge it behind my back, or even under my belly. I find that it provides just the right amount of support, without taking up tons of room. I have a big pregnancy pillow, and dislike using it because it takes up more than half of the bed! Poor hubby! I am so glad that I have the Owie Pillow. I love knowing that I can have it ready to go into the car when we leave home the morning S is born. It'll be waiting for me on the car ride home, and I'll have cushiony comfort around my abdomen as I recover from surgery. I will also use the pillow at home, as a buffer between me and my five-year-old. He is a big time snuggler, and it'll be hard for him to have to stay off of me for 6 weeks after surgery! Hopefully, the pillow will provide comfort and protection around my abdomen, and we can still get some snuggle time in! I'll take it any way I can get it. 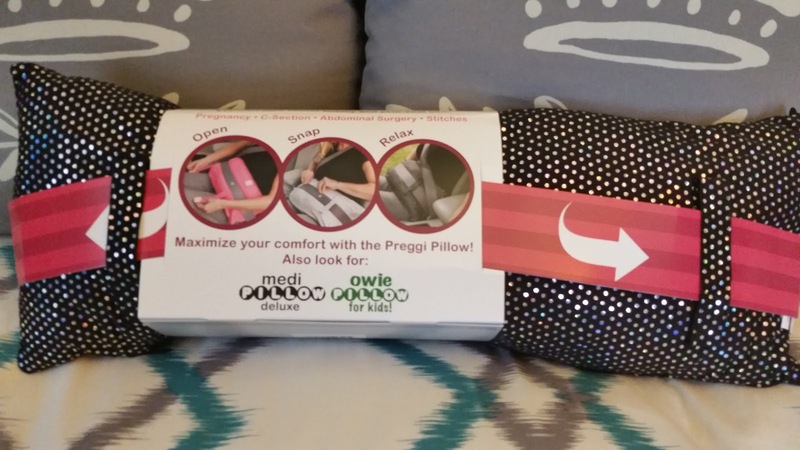 With so many great uses for the Preggi or Owie Pillow, everyone should have one! If you know someone who is expecting, this would make a wonderful baby shower gift- especially if you know that they have planned to have a C-section. Know someone who will be having surgery, or is recovering from surgery? The Owie Pillow would make a thoughtful get well gift! Head on over to check out The Owie Pillow on Facebook! The pillow is available in three styles/colors: Pink, Black or White. 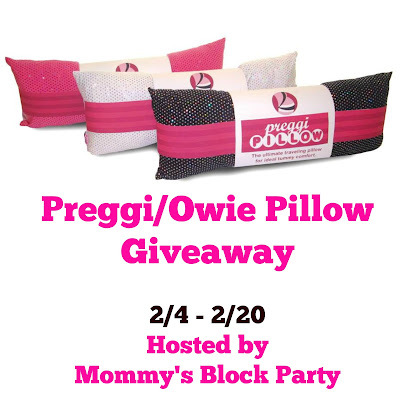 One lucky reader will win an Owie/Preggi Pillow in their choice of color! This giveaway is open to US residents, 18 and older- no PO Boxes, please. Just use the RC entry form below to enter for your chance to win! Please note that MBP is not responsible for prize fulfillment. Please see our policies page for complete details. 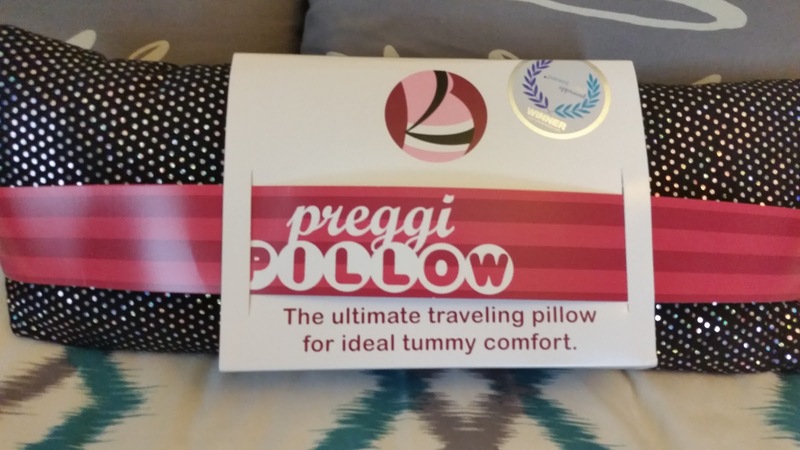 Special thanks to Kristine and Owie Pillow for allowing me to share about this wonderful must-have product for pregnancy and beyond! I want to win this pillow for stylish comfort. I think this pillow would come in handy at work to help support my lower back. I will be having my third c-section. I would use it after that. I would like to give this to my pregnant niece as a gift. This would be handy after someone has abdominal surgery. THIS IS GREAT. FIRST TIME I'VE SEEN ANYTHING LIKE IT! I'D LOVE TO WIN TO HAVE THAT EXTRA LAYER OF COMFORT NO MATTER WHAT I MAY BE DOING!